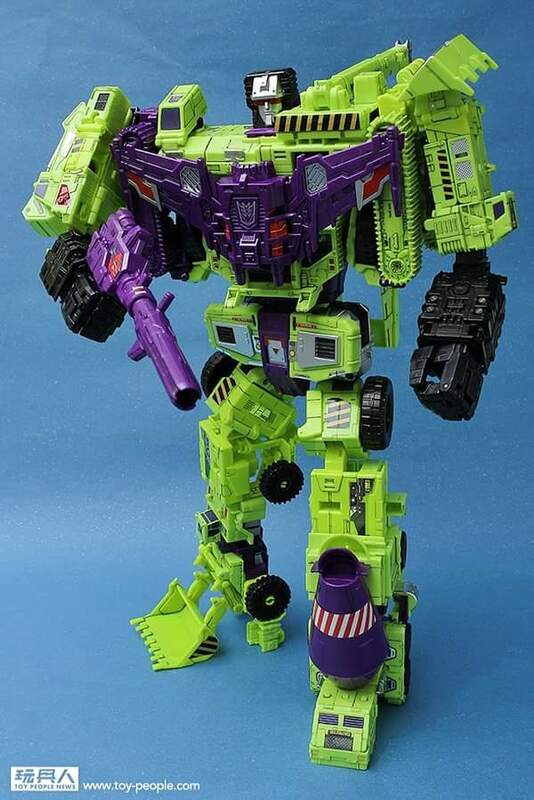 Thanks to board member Blindspot77, we learned that the website Toy People News published an article showing some tips and tricks on adding details to Titan Class Devastator. 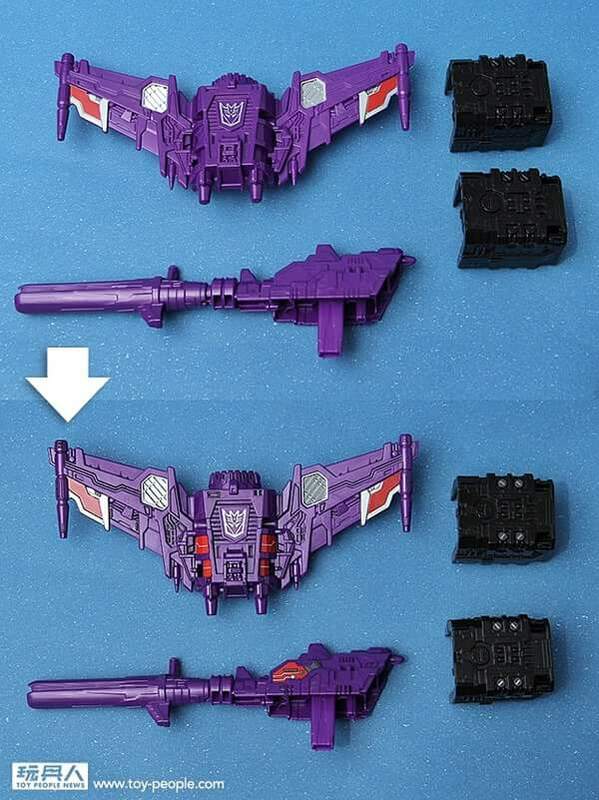 Among the images in the article was one showing an official sticker sheet being used to customize the Titan Class figure for added G1 accuracy, very similar to the sheet designed for Superion and Menasor. 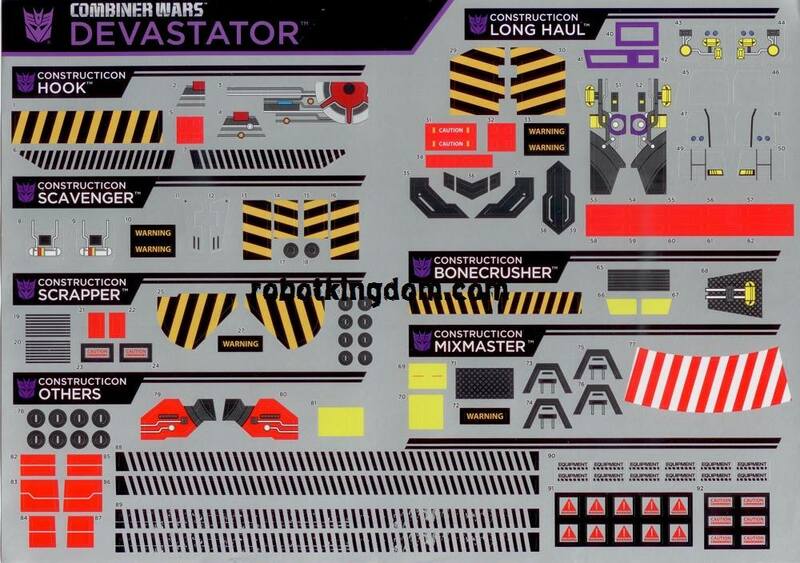 The sticker sheet appears to be printed on a metallic background, featuring stickers for all 6 memebers of the Constructicons. In the article, the author mentioned the sticker sheet was simply included in the box with this release in Taiwan. The instructions printed on the back of the sticker sheet is written in Traditional Chinese, which may suggest its exclusivity to the region. Unfortunately, it is unknown whether this will be available through other means at this time, but be sure to stay tuned for the latest development. 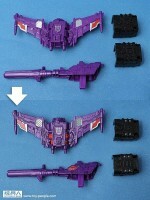 Check out some of the mirrored images below, and let us know your thoughts on this apparent Hasbro Asia exclusive item. 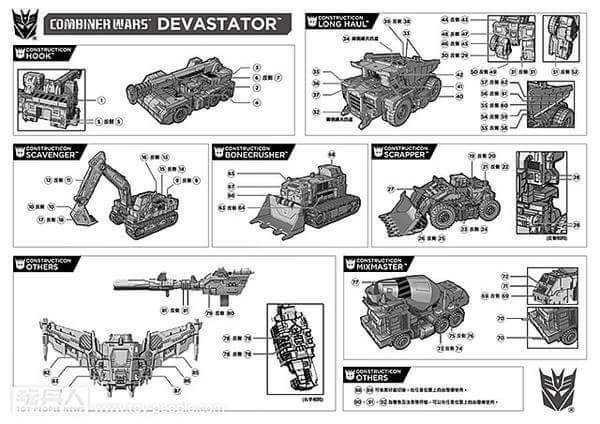 Are the long silver ones caterpillar treads for bonecrusher & scavenger? 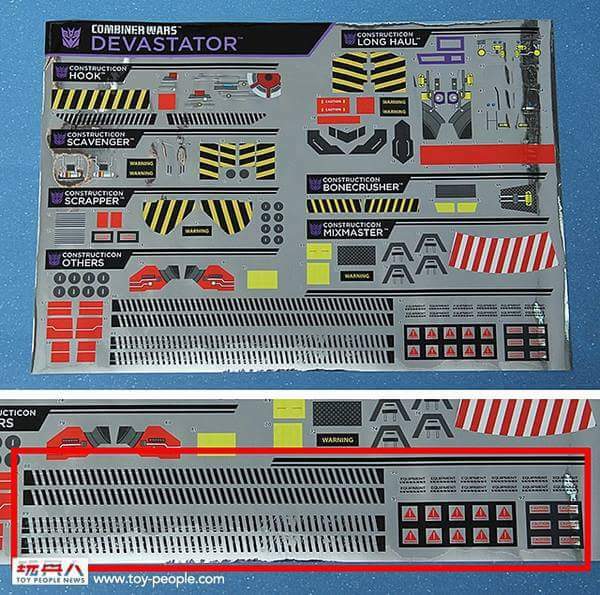 I take it people have also seen that there's now a licensed Ocean Detail set of decals for Devastator. Found on eBay and Uncle Billy on AliExpress. My understanding is these are PVC rather than paper and that whilst they're more involved to apply them I'm guessing the result is much better? Has anyone any experience of this "Revised" version? Or can point me to more info/threads. I can see extra labels but can't make out whether the new added grey is a good thing. 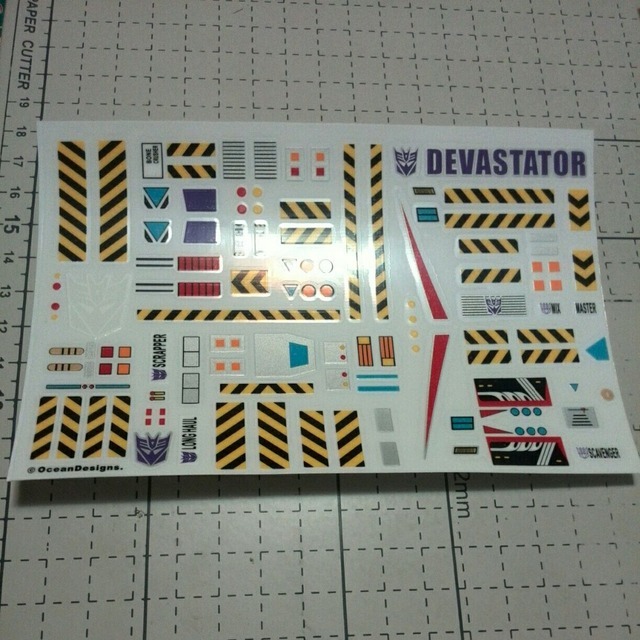 Sorry to necro this thread, but for those who still want these stickers, the CW Devastator I ordered from tfsource a few days ago came with a sheet. Not sure if every tfsource Dev is going to have them (probably not tbh), but at least a few probably do. That Ocean sheet is $8 here in HK. $18 is absurd; even more so than not being given them free to begin with/having them factory-applied. I'm a bit fed up with this nonsense. I understand Asia's booming right now, it's like…THE place to be, I get it, but you know we paid their damn bills and lined their pockets for a good portion of the past 30 years, as well. There's a world outside of Asia that would like some crumbs thrown it's way, too. It's a sticker sheet, it's not that expensive to produce. Make it available, Hasbro. so the US consumer is screwed again? less paint apps, less articulation, then region-specific sticker sheets. this is similar to the posing stands that were available for AoE but saw absolutely no release in the US. thumbs all the way down, Hasbro. I think it's kinda BS that Hasbro cannot give us a damn sticker sheet in the states. I'm totally mystified as to why the hell Hasbro wouldn't sell this to us separately if they wouldn't put it in the box to begin with. They're stickers, and they aren't expensive at all to produce once you get past the initial setup charge at the printer. Hell, make it a mail away thing, like the olden days. I'm pretty pissed that I'm going to have to pay through the nose for either this or the Reprolabels set. And if Hasbro doesn't want to sell the sticker sheet in other regions one easy solution would be for them to just host a high res full size pic on a site to have people download themselves as they want them. That way all someone has to do is print them out on sticker paper, or clear mailing labels and clear coat them and anyone who wants them can have them. I had to contact Uncle Billy to send on images showing where all the decals go. They make more of a difference in bot/alt mode than combined. They're also hella fiddly. I've probably done about 40% of them in about 3 hours with a scalpel and a couple of small tools. Edit: Dunno why, imgur does't seem to like this site as a referrer. If you cut-paste the URLs they work. Is this Ocean set seriously $18? Dammit. 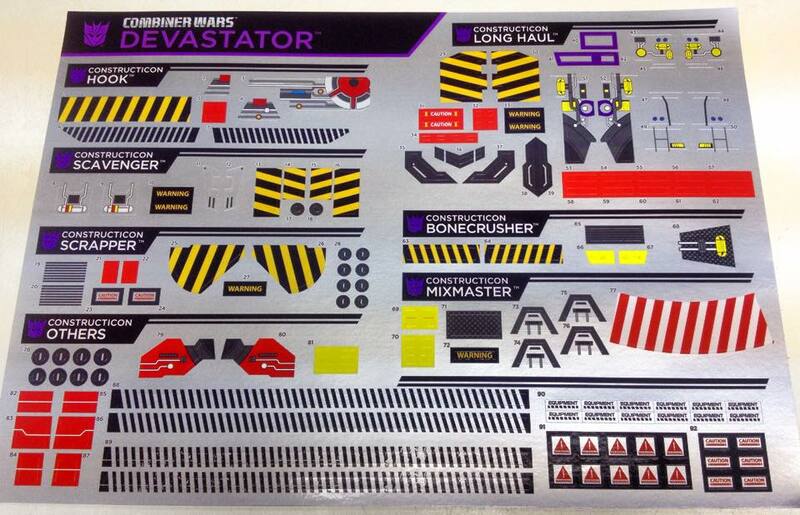 I'd really like to get a set for my son's Hasbro Devestator. I don't think I could ever apply those stickers correctly. Combiner Wars sticker promotion 3rd Round !! 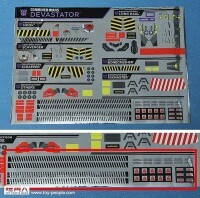 Any members bought or buy any Hasbro or SDCC Combiners Titan Devastator from hobbybase can get sticker in free !! First come first serve!! * Takara Version not included. The response said "at this time", so it could go up on TFSource in due time. Be patient, please. 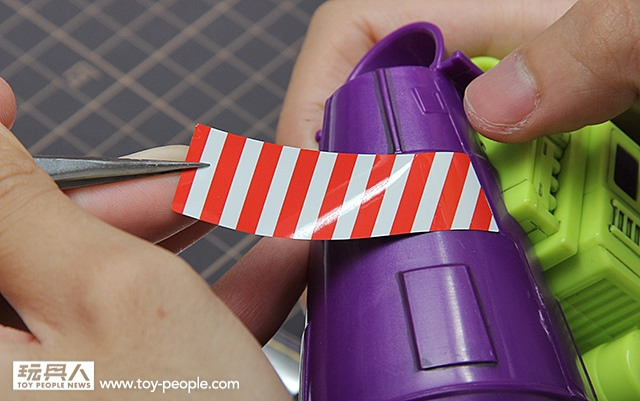 It's not like one sticker sheet is the end of the world or anything. If not, there's always the Reprolabels set. That set has wheel stickers. 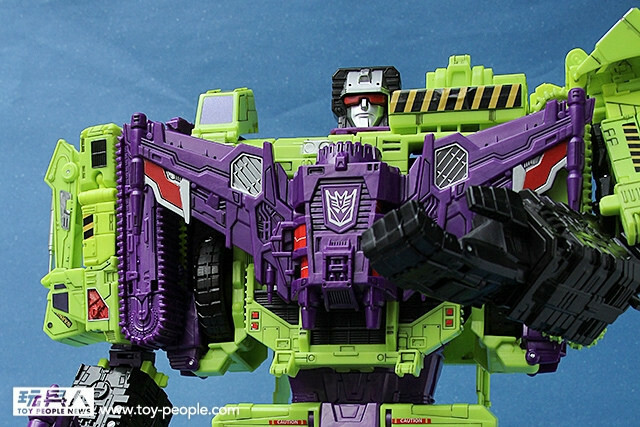 But, my question is, why are you guys whining about a sticker sheet that may as well be exclusive to Taiwan, when there's a sticker sheet from Reprolabels that gives you the same result: a more detailed Devastator? My problem is Reprolabels themselves. After three transactions that received horrible customer service, I refuse to deal with them anymore. Last time I ordered from them, the "customer service" rep, all but blamed me for an order they failed to fill. The time before that, they couldn't be bothered to inform me that the materials were backordered. Sorry if it sounded like I was impatient, wasn't my intent. Was just upset that Hasbro apparently can't share thing between their various departments. Finally heard back from Hasbro US..
".. Individual parts, like the sticker sheet you mentioned, are NOT available to purchase separately at this time.."
What a crock of @#$^!! Seriously?!?! It's that difficult to print EXTRA and sell for a couple of bucks on your website Hasbro?!? So, are those panel lines and weathering stickers too?